After last Ice Age retreated, around 10,000 BC, clay was extensively deposited in this area on which gets deciduous forest developed. It is very uncertain when this area was cleared of trees. The name 'wold' suggests that the area was wooded in Anglo-Saxon times but this does not preclude earlier clearance which had reverted. Archaeological excavation elsewhere in the county has shown that land was cleared of forest and ploughed during the Neolithic and Bronze Age period, around 3,000 BC. It is probable that the trees in this area were cleared at a similar time. So far there is no evidence of settlement in the parish much before Roman times, except the recent discoveries of middle and late Iron Age pot sherds and a late Iron Age coin; but more detailed investigation could change this. If any burial mounds of other earthworks of the Bronze Age ever existed hereabouts they were probably ploughed away in the Iron Age, based on the evidence from aerial crop mark photography in other parts of Leicestershire. The scant evidence of pre-Roman activity in Wymeswold is a flint scraper fragment of indeterminate age and an early Bronze Age flint arrowhead, both found to the west of the village. In immediate pre-Roman conquest period this region under the control of the Corieltauvi tribe. The Fosse Way may well have been a major trading route before the Romans, and the Burton road running just to the south of the parish was also known to be an ancient trading route, known as the 'Salt Way'. The original course of the Fosse Way runs slightly to the west of the present A46 and there was a Roman town near what is now the Wymeswold-Willoughby boundary. The name means 'Great Sacred Grove' and it is reasonable to suppose that this was a sacred place in pre-Roman times, possibly a Druidic grove, and perhaps even more ancient sanctity. 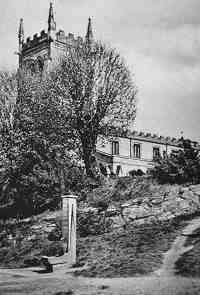 According to eighteenth century antiquarians there were tales of the ruins of a Saxon church near this site. Recent discoveries of late Anglo-Saxon metalwork suggest that there may have been such a site. In Iron Age and Roman times there may have been several separated farmsteads in the present parish, but not a village as we now know it. Some, at least, of these Roman settlements were continuations of pre-Roman farm sites. The buildings were probably constructed of mud walls with a thatched roof and were occupied by peasant farmers. No evidence of brick and tile 'villas' has been found. Left and centre: Two 1st century Roman 'trumpet' brooches found in Wymeswold. Right: 1st or 2nd century Roman 'dolphin' brooch found in Wymeswold. Reproduced by kind permission of Leicestershire Museums. The close proximity of Vernemetum must have had a substantial impact on surrounding farming activities. Roman finds in the parish include fragments of pottery, coins and jewellery, most of which is in private hands. It is becoming clear that duirng Roman times this area was well populated, with settlements to the north of Narrow Lane and the north to present village. During 1990 a late Iron Age/early Roman occupation side was discovered when the building of new houses between Orchard Way and Wymeswold Hall. Intriguingly, one of the fragments of pottery is from a cheese press, suggesting that there were dairying activities in the village nearly 2,000 years ago. It was during the late Saxon period (700-900) that Wymeswold village, together with its associated roads and footpaths, probably took shape. In early records the name appears as Wymund's wald (or wood) and this may indicate an association with Wymund's ham i.e. Wymondham in the east of the county. S.P. Potter in his early 20th century History of Wymeswold is of the opinion that Wymund was the son of Witchlaf, the Duke of Wicci, and was married to Alfleda, daughter of Ceowulf, King of the Mercians, in 846. Wymund died of dysentery and was buried in Croyland Abbey, Lincolnshire. Potter gives as his source monastic scholar Ingulphus; but the documents themselves are not cited and his version should be regarded as highly doubtful. Mid-Anglo-Saxon silver-gilt disc-headed pin and a gilt-bronze 'plate' brooch found to the east of Wymeswold village. On display at the Charnwood Museum, Loughborough. Three Anglo-Saxon burials, one with a knife, have been excavated to the west of the village. A mid-Saxon silver-gilt disc-headed pin and a gilt bronze 'plate' brooch (whose quality makes them of national importance) and other bronze brooches have been found in recent years to the east of the village. Although very few Saxon coins had been found in Leicestershire, at least five have been found in the parish. They suggest that there were trading links with East Anglia at this time. At least eleven decorative strap ends have been discovered on the site of the Saxon church near Vernemetum, which is about half the total of such items for the whole of the county. A Frankish brooch and a Kentish style disc brooch have also been discovered in this area. There is every indication that Wymeswold was an important area in Anglo-Saxon times. Stockwell pump, from an old postcard. 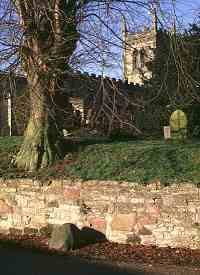 Wymeswold parish church is sited on a raised mound, which now has a retaining wall. The spring which was known as the Stockwell issues from the south-west of the church mound, although the water is now culverted. The combination of mound and spring is typical of many church sites in England and indicates that the site was probably sacred for many centuries before Christian times. A small boulder can still be seen to the north-east of the churchyard wall. This was, until recent times, situated closer to the main road and stood about twice its present height. In the course of being moved the stone was broken. It is typical of many mark stones which abound in Leicestershire – although few are documented. Some may have acted as markers for moots or boundaries but often, as with Wymeswold, their purposes is unclear.